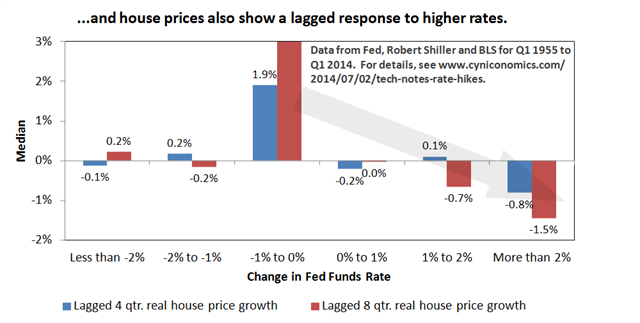 Planning for Future Interest Rate Hikes: What Can History Tell Us that the Fed Won’t? These consequences follow not only from the arithmetic of debt service and present value calculations, but also from the mood swinging psychology of entrepreneurs, lenders and investors. Yet, policy economists claim that interest rates can be “normalized” at no cost. And how should we interpret “a little bit”? According to FOMC projections, a little bit of normalization gets underway sometime next year and then leads to a steady pace of policy adjustments that doesn’t stop until the fed funds rate reaches almost 4%. These projections are accompanied by predictions for an improving economy as policy tightens. Escape velocity or escape from reality? The FOMC simply doesn’t acknowledge the time-tested effects of rising interest rates noted above. Instead, central bankers argue that today’s monetary stimulus will produce such economic vitality that there’s no sting in tomorrow’s tightening. In other words, they forecast an “escape velocity” where the economy is presumed immune to monetary restraint. But is there any basis for their beliefs in the economy’s actual workings? Or, is escape velocity merely a convenient story for central bankers predisposed towards easy money and short-term thinking? We’ve argued that the Fed’s current policymakers have exactly this predisposition, and that there’s no such thing as escape velocity. We’ve also shared historical evidence supporting our views – in “M.C. Escher and the Impossibility of the Establishment Economic View,” for example – and take another look at history in this post. We then review economic outcomes conditioned on the rate buckets above, recording the median outcome for each bucket. In most cases, we compare interest rate changes to outcomes for subsequent (lagged) 4 and 8 quarter periods. The present expansion is weaker than any other post-World War 2 expansion, suggesting that it won’t take much of a slowdown to push the economy into recession. Monetary policy has been exceptionally loose for longer than ever before, allowing financial markets more time to become overpriced and complacent. There are many more risk-takers in the global economy who’ve learned how to exploit cheap dollar policies than there were in, say, 1955, the start of the period shown in the charts. Most importantly, aggregate debt is at or near record levels, not only in the U.S. but also in other large economies. Our conclusion is to reject forecasts calling for the economy to power right through interest rate hikes without stumbling. 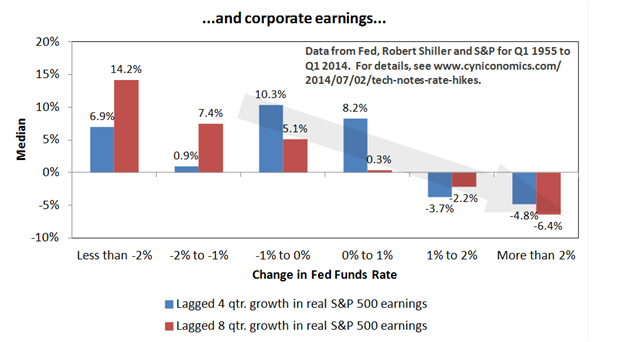 A more likely scenario is that policy “normalization” leads us directly into the next bust. Alternatively, the Fed might abort its planned rate hikes, allowing economic and financial market imbalances to continue growing. Either way, we can expect recurring booms and busts until our monetary approach is rebuilt on stronger policy principles.